The Southampton Boat show is now over for another year and what a show it was! The 10-day event started in glorious sunshine and for the first 5 day’s we were joined by Nordhavn’s company president Dan Streech; who had flown in from California. As expected the first weekend was very busy with keen sailors and boating enthusiasts along with families looking for a good day out. We ourselves managed to catch up with several of our current owners and met with some very promising prospective owners. As the week went on the weather changed and by Friday we had wind gusts of 40 knots which made navigating the pontoons quite tricky at points. Still, we were fortunate enough to be on the right type of vessel for the occasion, and given our outside position, we barely felt any movement from the choppy waters outside. 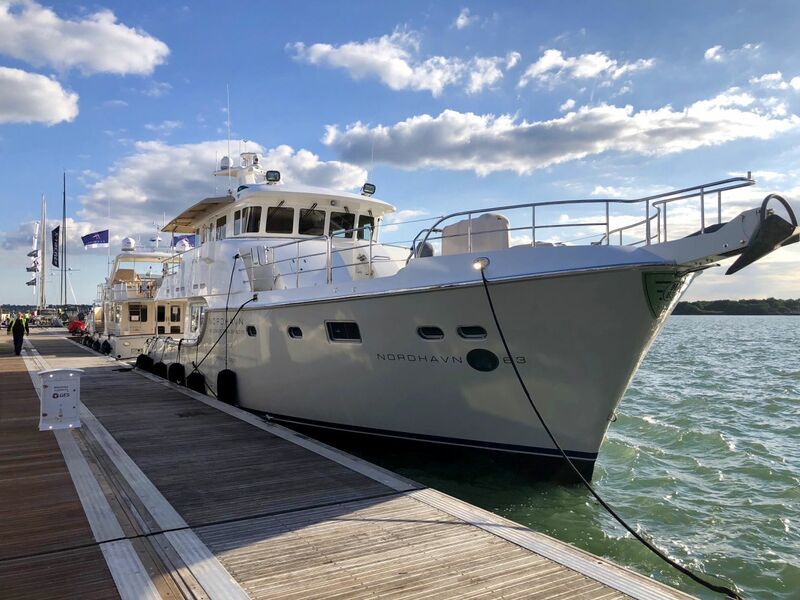 “Due NORTH” has done us and the Nordhavn brand proud and we very much hope to find her a new owner in the coming months. If you would like further information on “Due NORTH” please see the listing of her in our brokerage section.